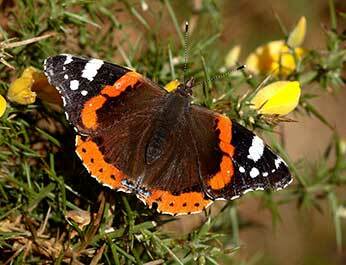 Although in some years abundant and widespread, Red Admirals occur annually in variable numbers. They are primarily migratory creatures that originate in North Africa and continental Europe, but small numbers sometimes successfully over-winter in Britain, particularly in the south of England. Red Admirals are large insects - wingspan is around 7 centimetres - with bold, mainly black, red and white patterning that probably needs little description. The underside of the hindwing, however, is altogether duller, and provides effective camouflage when the butterflies are at rest with wings closed. Both sexes are of similar appearance. Red Admiral sightings are often reported in virtually every month of the year, although they are most frequently seen from spring until October and occasionally during mild spells in November. Following spring and early summer matings, newly emerged insects are on the wing from around July onwards. They are frequent garden visitors that also occur widely in the countryside, including in much of the New Forest - wildflower-rich woodland rides, woodland edges and clearings are often favoured, and so is heathland when the heathers are in bloom. Nectar is taken from a large variety of flowers, whilst the juices of rotting fruit and tree sap will also be enthusiastically devoured. Feeding is said to become a late summer preoccupation, presumably in readiness for return migration, which can sometimes be observed from the Hampshire coast, or to build up reserves in preparation for over-wintering attempts.